While J.J. Abrams is dead set on casting relative unknowns in most of the roles for Star Wars: Episode VII, there’s been three particular roles that fans have been keeping there eyes on: Han Solo, Princess Leia Organa, and Luke Skywalker. The core of the original trilogy, the three of them have been rumored and somewhat confirmed here and there, with no definitive announcements coming from Walt Disney Studios just yet. Carrie Fisher, Harrison Ford, and Mark Hamill all look as if they’re tentatively ready to join production on Star Wars: Episode VII, and a recent round of clues have stoked the fires of speculation even further. So Carrie Fisher seems like a really good lock for Episode VII, which would lead one to assume that at the very least, Harrison Ford would be along for the ride. As luck would have it, he was spotted in London last Thursday and Saturday, which gives us an overlapping timeframe for the legendary pair. However, the real clincher is a piece of evidence that seemed innocuous enough when provided during Mr. Ford’s recent AMA on Reddit. 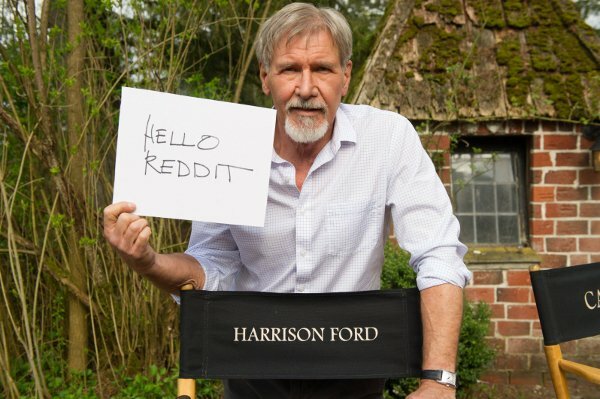 As you can see, he’s standing in front of a director’s chair with his name on it, and sporting facial hair that doesn’t seem to match any recent projects he’s promoting. Also, if you look in the bottom right hand corner of the image, you see two letters on the chair next to him. Could it be a coincidence that "CA" would belong to a co-star other than Carrie Fisher? Possibly, but the third piece of the casting puzzle is what’s set everyone off in a frenzy of confirmation without announcement. With two acting gigs in post-production according to IMDB, and nothing else on his plate besides voice over roles, Hamill is more than available for the production of the latest Star Wars film, but has the weakest evidence towards his involvement. Still, the basic confirmation of Carrie Fisher, Harrison Ford, and Mark Hamill in London at the same time, with shooting already underway and a casting announcement imminent, makes for a possible royal flush of confirmation. It’s not against J.J. Abrams’ style of "mystery box" filming to hide key information like this, no matter how obvious it may seem. In fact, there’s a good case that not only are they going to be in Star Wars: Episode VII, they might already be filming it. For now, all anyone can do is cross their fingers and hope there’s an official announcement soon, so we can start focusing on the next big question: what’s the movie going to be titled? Star Wars: Episode VII looks to disturb your holiday shopping on December 18th, 2015, unless Alan Horn’s comments about possibly moving the film back to May 2015 become a reality.